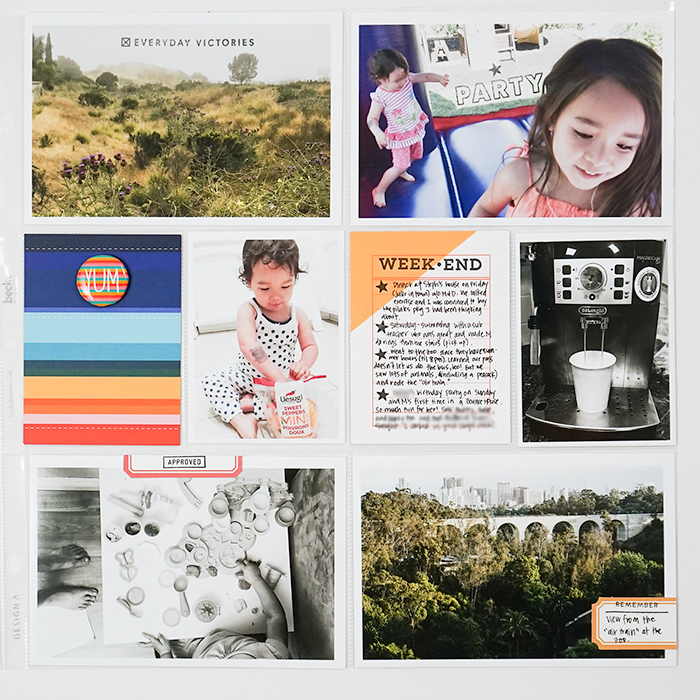 Today I'm sharing another week I completed last weekend during the baby's nap time. I kept it pretty simple again to get it completed. 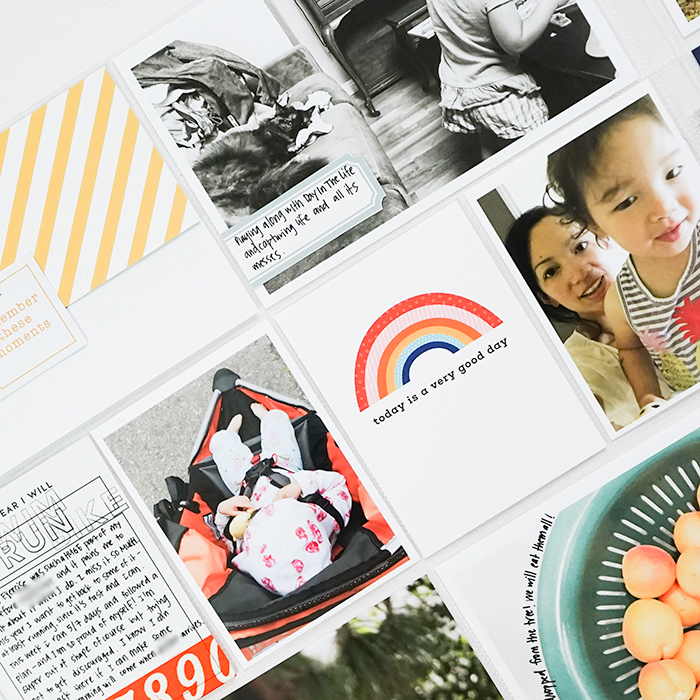 Project Life to me at its core is really just photos + stories. I have to remind myself that, because sometimes I can get hung up on making things look perfect and pretty. 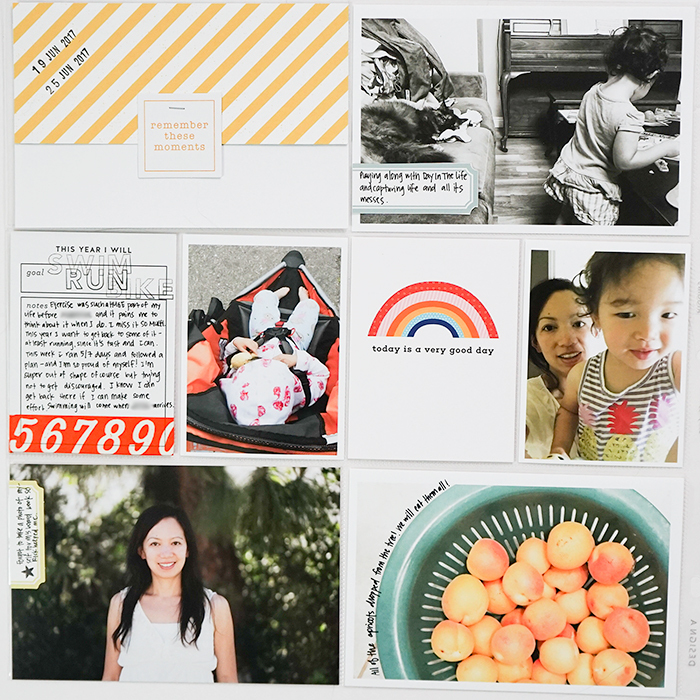 I pulled most of the cards from Kelly Purkey's recent monthly kit, Document the Days. I liked the bold and happy color scheme and thought they matched the photos this week. The week included a Day In The Life, so I had a lot of photos to choose from, and it seems that I was in a photo-taking mood all week! The date card was made from some scrap paper that I adhered to white cardstock to make a 4" x 6" card. I stapled a die cut (from Gossamer Blue) on in a similar color, and stamped the dates along the diagonal lines. 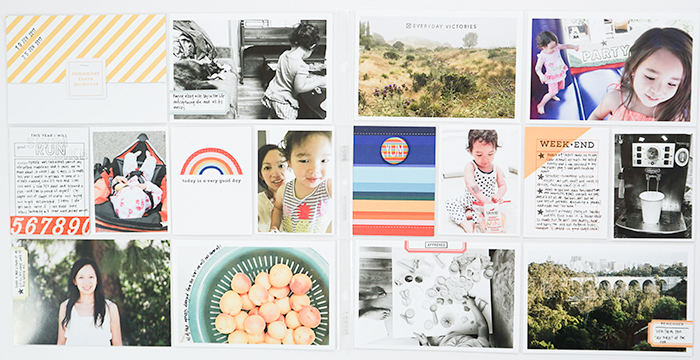 The "This Year I Will" goal card comes from the Roman Holiday Studio Calico kit. I stamped "swim," "bike," and "run" on the card, and wrote about my exercise goals this year. I've started running again recently and it feels awesome. Before I had my daughter, I used to workout everyday training for triathlons. It was a huge part of my life and a difficult transition for me to go from hours exercising daily to... nothing. I miss it a lot. I used labels to add a few notes on the photos. This is an easy way for me to add some journaling without using my computer. Using a fun planner stamp set I received in a recent Studio Calico grab bag, I stamped some of the phrases on the labels ("approved", "remember"). I also used the star stamp from the set on a few photos, and as bullet points for the "Week-End" card. The "Yum" badge is from Studio Calico (I think?) and has been in my stash forever. I thought it looked fun to layer the stripes on the striped card. It's paired next to the photo of my daughter eating sweet bell peppers for breakfast. She continues to be a good eater and I have to document it in case it changes later!